Sony's Days of Play sale is now on, with 11 days of ridiculous PlayStation deals across consoles, games, accessories and more. And, as part of the gaming deal-a-thon, Sony is selling a Limited Edition Days of Play PS4 console. 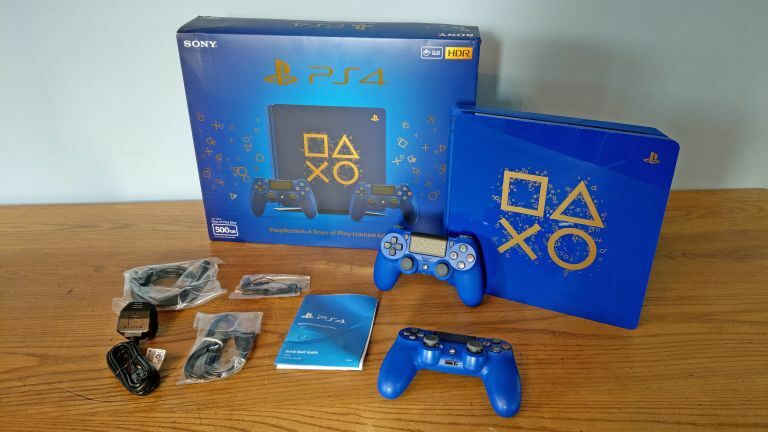 The exclusive, one-time-only, Days of Play Limited Edition PS4 console has been specially designed for the event and is a 500GB PlayStation 4 with two wireless DualShock 4 controllers in a distinctive blue and gold colour scheme. The Limited Edition Days of Play PS4 console is available now during the Days of Play sale, which runs until June 18, from select retailers including Game, Amazon, ShopTo, Smyths, Very, and Currys PC World. To see what the Limited Edition Days of Play PS4 console is like, as well as what you get in the box, then watch T3's unboxing video below. As well as the Limited Edition Days of Play PS4 console, other deals currently up for grabs include some tasty bundle packages on the PS VR Starter Pack, coming with either the WipeOut Omega Collection or Gran Turismo Sport for just £199.99, as well as tasty discounts on top titles like God of War, Shadow of the Colossus, Uncharted 4, Assassin's Creed: Origins, Grand Theft Auto 5, Horizon Zero Dawn, Call of Duty: World War II and Gran Turismo Sport, which are retailing for as little as £15.99. For more information about the Limited Edition Days of Play PS4 console, and the various other discounted products currently available, then head on over to its official web page.